“Please call 911. Are u available tomorrow? My Officiant backed out. 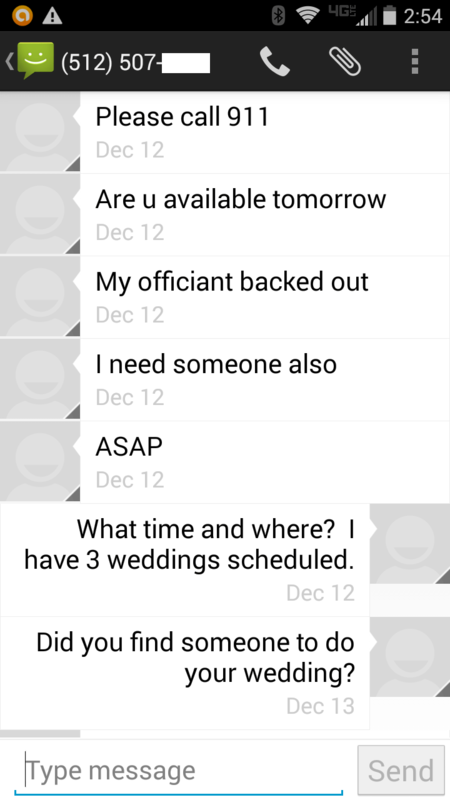 I need someone [ASAP].” So began a text conversation with a Bride I had met with, but decided to “save a few dollars” and hired someone else. I know this because she told me she wished she hadn’t worried about the difference in price and had hired me, then she wouldn’t have been in this mess. I’ve officiated weddings for 10 years and in the last couple of years I’ve noticed an increase in the number of “Officiants” and the number of brides I’m receiving messages from, like the one above. Brides are being abandoned within days of their wedding, and sometimes even the day of, and this makes me frustrated because I don’t think brides understand the level of service officiants should be providing. I don’t see the wedding industry educating brides and grooms on what to look for and what to expect. An experienced professional officiant’s service goes beyond filing the marriage license and pronouncing a couple as husband and wife. An officiant should be capable of being the truest master of ceremony. A qualified Officiant should have lots of great reviews, not only from brides and grooms, but from venue owners, wedding planners, and other wedding professionals. An experienced officiant should know how to lead a rehearsal better than a wedding planner, because this is their specialty. An Officiant who cares about the couples’ experience should know all that can go into a wedding ceremony and know the current trends and marriage license laws. While the reception is often given a lot of attention to insure its success, sometimes the ceremony itself is an afterthought. It’s great to have the best videographer to capture your ceremony, but if your officiant doesn’t know what they are doing or doesn’t offer to make your ceremony as personal as it should be, then your video won’t be enjoyed or looked back on with fondness; it will look more like a business transaction at the altar. There are special readings and unity ceremonies that can be incorporated, and if desired they can include family members or close friends. There are cultural traditions that add a lot to a couple’s ceremony, and ways to honor special people who have passed, but many couples never know about these options because they’ve not met with an experienced and proven officiant who educates them, and then their ceremony is not all it could be. There are the 3 people required to get married: the bride, groom, and officiant/minister. Your officiant is the first person to speak to your guests – do they have a voice and presence for the occasion? Does your Officiant’s personality reflect yours? If you ask your Officiant questions about the ceremony, can they answer clearly and make suggestions, or do they need to ask someone else, because one who is qualified should know. Yes, there is a broad range in what an officiant’s services will cost. Like other wedding professionals, this price range is reflective of experience, level of service, and even day and time of the wedding. Having a qualified officiant isn’t just for large weddings, even small intimate weddings can be enhanced by an officiant that makes it personal because he/she took the time to get to know the couple and understand their desires for their ceremony. It is an honor, a privilege, to be a part of a couples coming together in marriage; I take it very seriously. My hope is that couples will understand the value of an officiant who knows all that goes into a ceremony, so they can be confident in who they hire and not be left sending “911” messages the week before their wedding.